Remember a few months ago, when I was all excited about my new French press? Well… I still totally love it! 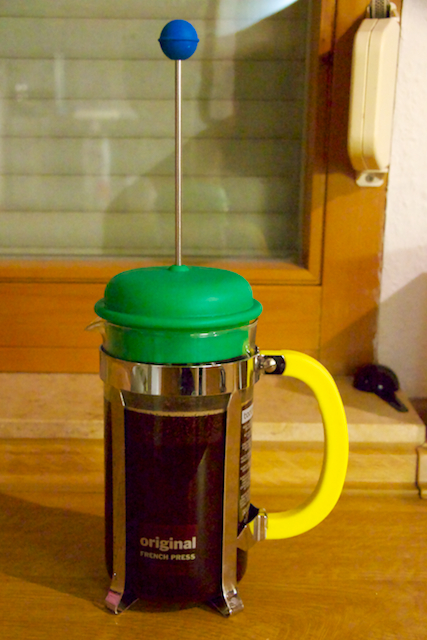 Of course, now that summer has come to Germany, I'm not much in the mood for hot coffee in the mornings. But I still like that little caffeine hit. Dilemma, dilemma. I spend a lot of my mornings at our local Java Cafe, hard at work blogging and editing photos. Like many places in Germany, there is no air-conditioning only fans. On a whim, I ordered an iced coffee one morning, and that's when it struck me. Why couldn't I do this myself at home?? If you know me at all, then you know what happened next. 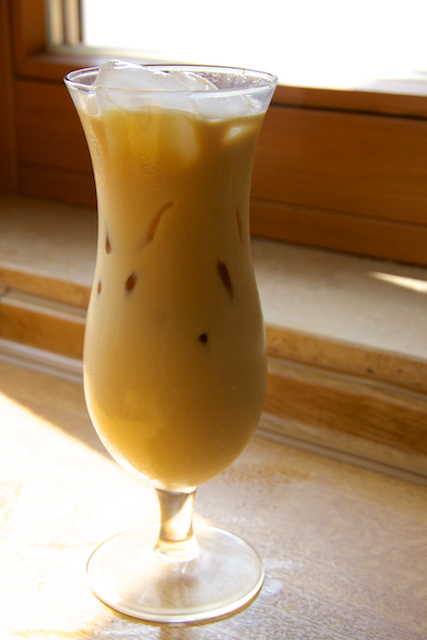 Iced coffee happened, peeps! But not just any iced coffee. 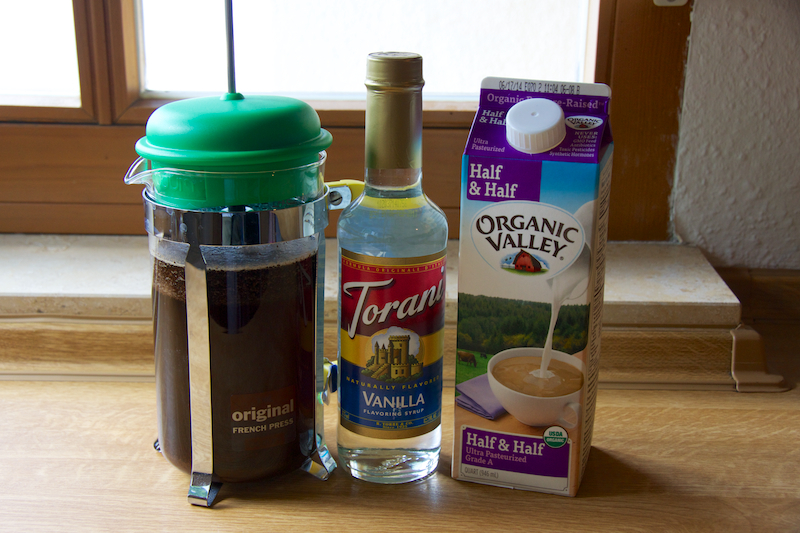 This is a cold-brewed, French press version of iced coffee. I know, I'm pretty awesome. This chilly beverage was so yummy, even Lucy was begging for it (I accidentally spilled a little, which she quickly gobbled up). French press and your favorite ground coffee, that's it. I gotta be straight up with you, my friends. Dunkin' Donuts is the best coffee ever. 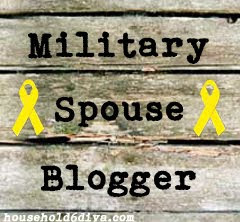 I will assume you agree. 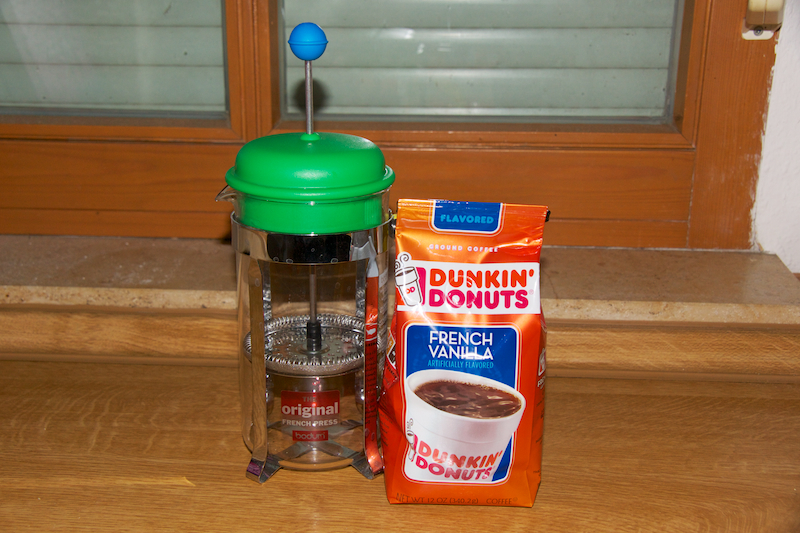 To your French press, add ½ cup ground coffee (I'll pretend you are all using Dunkin') and 3 cups of COLD water. The water must be cold, no hot-brewing for us! While the cold-brew technique takes longer, I find it produces a much smoother coffee base, which I like. Gently stir things around, then replace the lid on your French press. But don't push down the plunger yet!!!! Notice the position of the plunger, ok? Now, you just walk away. That's right, walk away. For at least twelve hours. I like to mix this at night, then I'm all set for iced coffee in the morning. 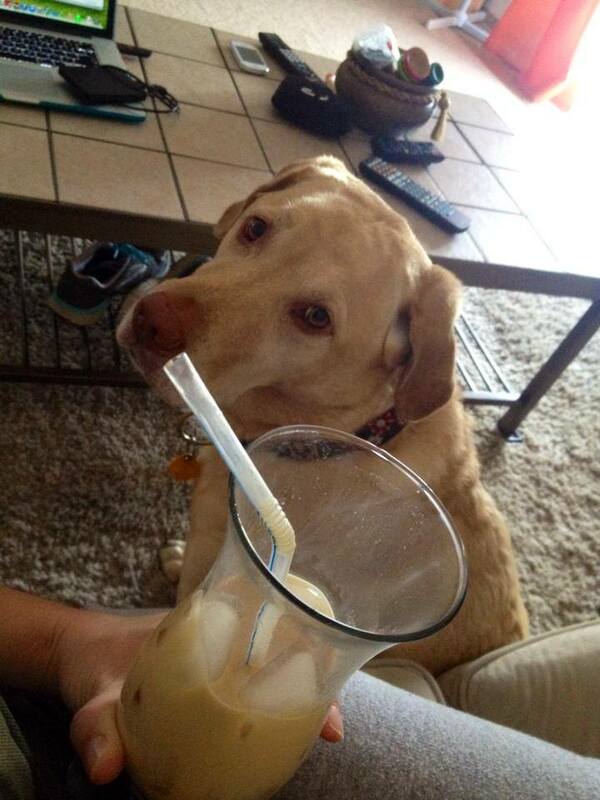 Technically, iced coffee would simply be coffee served over ice. You can totally wake up in the morning, press down the plunger, and pour your cold-brewed coffee over ice. OR, you can make this sweeter, flavored version that I think is awesome. Completely up to you. Here's what you do: Fill 4 glasses to the rim with ice (or one glass, or two. This recipe makes 4 servings, but you can store your extra cold-brewed coffee in the fridge for a week or so). Pour ¼ cup of half-n-half in each glass, and ½ - 1 tablespoon of the flavoring of your choice. I chose vanilla (and used ½ tablespoon), but you could easily use caramel, hazelnut, peppermint… anything really. Then, top each glass with ¾ cup of the cold-brewed coffee. Stir, and enjoy your awesomeness. As usual, the standard recipe is below. This is a basic recipe, with lots of options for customizing. Try different coffees, flavored creamers, various syrups or spices. I love the idea of a caramel and sea salt creation! In fact, I think I'll try that next. To begin, cold brew your coffee. Add the ground coffee to your French press, then top with the 3 cups of cold water. Gently stir the mixture, then place the lid on your French press but DO NOT press the plunger down. Allow the coffee to sit 12 hours or overnight. To make the iced coffee: Fill 4 glass to the rim with ice. 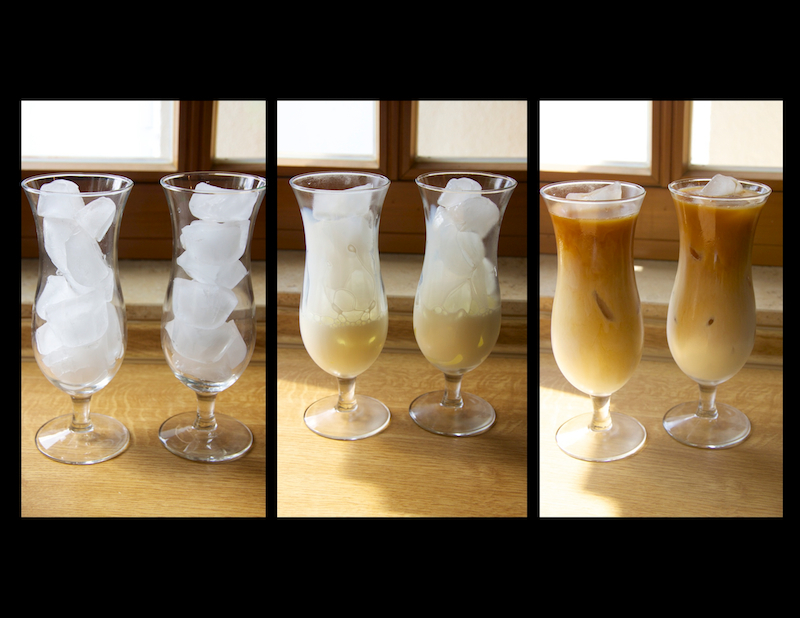 (use ice cubes made from coffee if you want to be really creative!). Pour ¼ cup half-n-half in the bottom of each glass, and up to 1 tablespoon of vanilla syrup (or syrup flavor of your choice). Top with ¾ cup coffee. Stir and enjoy! Just to clarify: when leaving it out over night you did not put it in the fridge, you just left it out? And also, if keeping it like you suggested, would you say to leave it in the press with the grounds or put it in a new container (sans grounds)? So I've tried it twice now. The first time I thought it tasted pretty weak so the second time I used 3/4 cup coffee (and also mixed a lighter and a darker roast) and on accident left it brewing for like 18 hours. Whoops. So this time it's a little strong. Cheers to trial and error and finding a happy medium! Yes, I think the brewing time would definitely change based on the type of roast you use. I generally have a medium roast and it sits out around 12-14 hours. I hope your next brew is perfect for you!